On Saturday, June 23, KaBOOM! 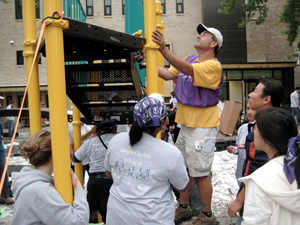 built its 100th playground in Chicago. For most volunteers, hauling mulch, mixing concrete, building benches, and assembling playground equipment was an entirely new experience. "Though I live in the Chicago area and have participated in the majority of the builds here, I have also traveled to several other states to volunteer on various playground builds. I first got involved with KaBOOM! when my employer, Fannie Mae, sponsored several playground builds in New Orleans not long after Hurricane Katrina. I enjoyed the Build Day so much that I have been addicted to being a KaBOOM! volunteer since. I have worked on 38 different playgrounds in various states. I go back and visit as many as possible and keep in touch with people I have met during the build; they are all being used to their fullest potential and the children love the site as much today as the day the caution tape was removed! There are three parts of the project that I love the most. First is Prep Days and all the work that goes into ensuring a safe and productive Build Day. And, then it's the end of the build day when the children get their first sight of the completed project. The expression on their faces and the squeals in their voices, it makes the whole project worthwhile. Finally, and this happens on most projects I have worked on, it's the gathering of the community to build a safe place for children to play. There have been numerous times when I have worked alongside of two neighbors on the same block who have never spoken and now they are working side-by-side and quickly becoming friends. And, I am always humbled when the project is complete and all the volunteers are standing together, looking at the results that hard work and a positive attitude can accomplish -- the pride that shows on their faces is indescribable." Three cheers to Ed and to all of our Chicago volunteers who have helped us bring 100 great places to play to children in need!